Glamorous dreams in a hardscrabble town. Local rappers “spitting” in free-style battles, gunning for the neighborhood respect they that can’t get at home or work. A rousing hip-hop anthem showcasing star making talent. 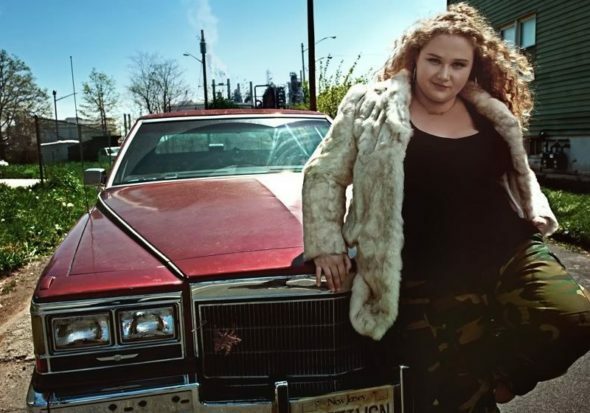 Sure, Patti Cake$ often smells what 8 Mile was cooking, but writer/director Geremy Jasper’s feature debut is loaded with enough exuberant sincerity and earnest button-pushing to succeed on more levels than it probably should. And since somebody mentioned star making, just try to turn your eyes away from Danielle Macdonald’s lead performance as Patti Dombrowski, a twenty-something bartender in New Jersey who stares across the river and dreams of NYC stardom. While the kids still call her “Dumbo,” Patti calls herself “Killa P,” rapping her original rhymes with constant support from her pharmacist friend Jheri (Siddharth Dhananjay) and no support from her drunky mom Barb (Inside Amy Schumer’s Bridget Everett). But when scary new musician friend “Antichrist” (Mamoudou Athie, The Get Down‘s Grandmaster Flash) turns out to be pretty handy with the beat boxes and recording equipment, a homemade CD just might punch Patti’s ticket out of Jersey poverty. Macdonald, a television vet plenty worthy of this move to features, keeps the entire film grounded in authenticity, which is good, because this entire film needs some grounding in authenticity. While contrived events and manipulative strings may be pulled around her, Patti’s daily struggles never feel false. The ways she deals with drunks at her bar, a potential new boss at a job interview, or the failing health or her grandmother (Cathy Moriarty, nice to see despite being too young for the role) are filled with a mix of exhausted resignation and cautious optimism well known to countless Americans just trying to get ahead. Jasper throws in enough stylish dream sequences and weirdly awkward close ups to expose both his inexperience and potential. What Patti Cake$ lacks in originality is made up in creative spirit, because like Patti, Jasper is a talent dreaming big. With Macdonald as a perfect muse, he’s making sure his own homemade CD has too much fairy tale pixie dust to ignore, with a final track too proudly shameless to resist.